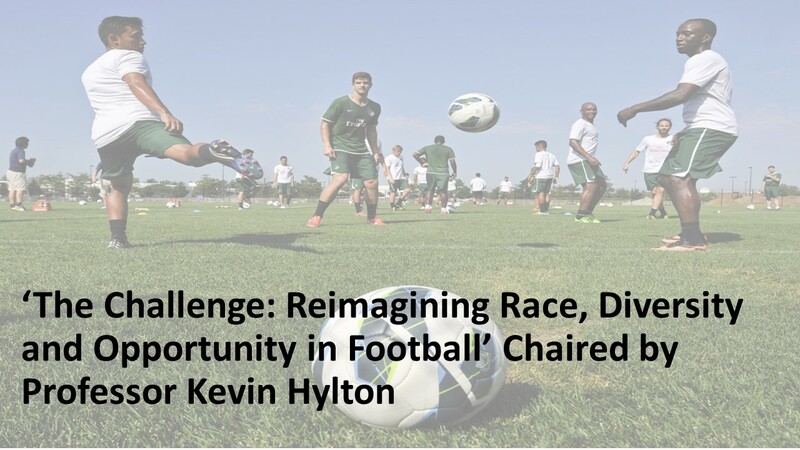 We are delighted to formally introduce the first keynote panel ‘The Challenge: Reimagining Race, Diversity and Opportunity in Football’ chaired Professor Kevin Hylton. The session is part of the ‘Challenging the Narrative’ – Critical thinking in football conference at Hampden in Glasgow on the 29th and 30th November 2018. Professor Kevin Hylton is Head of the Research Centre for Diversity, Equity and Inclusion, Leeds Beckett University, UK. Kevin is also Professor of Equality and Diversity in Sport, Leisure and Education and is the first Black Professor to hold this position. His research focuses on ‘race’ and social justice especially in sport, leisure and education. Kevin has published extensively in peer reviewed journals and high profile book projects. Kevin authored ‘Race’ and Sport: Critical Race Theory (Routledge, 2009) and Contesting ‘Race’ and Sport: Shaming the Colour Line for Routledge (2018). Kevin is Board Member for the International Review for the Sociology of Sport (IRSS), the Journal of Global Sport Management and Co-Editor of the Routledge Critical Series on Equality and Social Justice in Sport and Leisure. Kevin is Patron of the Equality Challenge Unit’s Race Equality Charter. Professor Grant Jarvie is Chair of Sport at the University of Edinburgh and visiting research Professor with the University of Toronto. He currently serves as an independent adviser to the Scottish Football Association. He is director of the Academy of Sport and leads Edinburgh Social and Political Sports Research [ESPSR]. Grant was the architect of one of the world’s first football MOOC’S- Football More than a Game – which is delivered both online and in local football stadiums. Born in Bellshill, Grant comes from an international sporting family, helped to steer the development of the National Para Sports Centre at Inverclyde and is a former Acting Principal of the University of Stirling. Funke Awoderu is a champion of equality and diversity and works tirelessly to break down barriers that exist, especially in football and tennis. Funke, currently holds a position as Senior Inclusion & Diversity Manager at the Football Association. Previously she held a role as Equality and Diversity Manager at the Lawn Tennis Association. Paul Elliot CBE is a former professional football with a distinguished playing career that saw him represent top flight teams across three countries. On retirement from the game Paul became integral to breaking down barriers in the game, especially in relation to equality and diversity. Indeed, as a reflection of this important work, in 2003, he was appointed Member of the Order of the British Empire (MBE) for his work with young players and his involvement with anti-racism initiatives in football. Furthermore, in 2012 he was appointed Commander of the Order of the British Empire (CBE) for equality and diversity in football. Paul has previously held roles in various organisations in football, namely The Football Association, UEFA, and Kick It Out. Currently, Paul is the Chairman of the FA’s Inclusion Advisory Board (IAB), representing them on the main FA Board. Paul is also an FA Council member and represents the FA Internationally on UEFA Fair Play and Social Responsibility Committee.